On paper, a film which is almost two hours of talking heads (with occasional photographic accompaniment) doesn’t sound like the most appealing prospect. But when you’ve as colourful a parade of characters as the past and present writers and artists at 2000AD magazine, just letting them tell their story makes for compelling viewing. Director Paul Goodwin has realised this, and that’s what makes Future Shock! The Story of 2000AD such a hugely enjoyable watch. According to Pat Mills (workaholic writer, 2000AD founder and all-round rage machine) British boys’ comics in the 1970s were a disgrace, built on embarrassingly genteel depictions of boyhood adventure which were decades out of date. Wanting to provide an alternative to American superhero comics, while at the same time giving British youth the gore, ultraviolence and subversive politics they craved, Mills created a magazine that would change the face of comics culture, and indeed popular culture, the world over. 2000AD was launched in 1977, featuring censor-troubling stories in a science fiction setting, and very quickly became a huge hit. 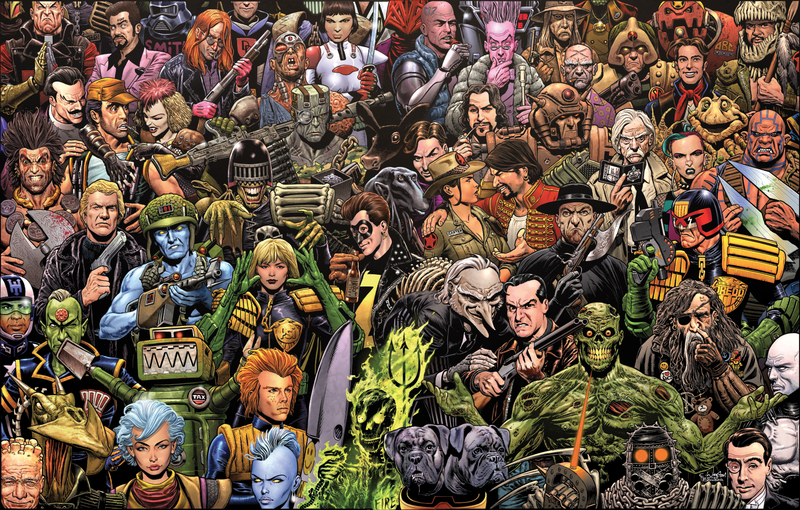 Over the next four decades there would be highs and lows aplenty for both 2000AD and its staff, but the legacy they forged through iconic characters like Judge Dredd, Rogue Trooper, Strontium Dog and Halo Jones is unforgettable. 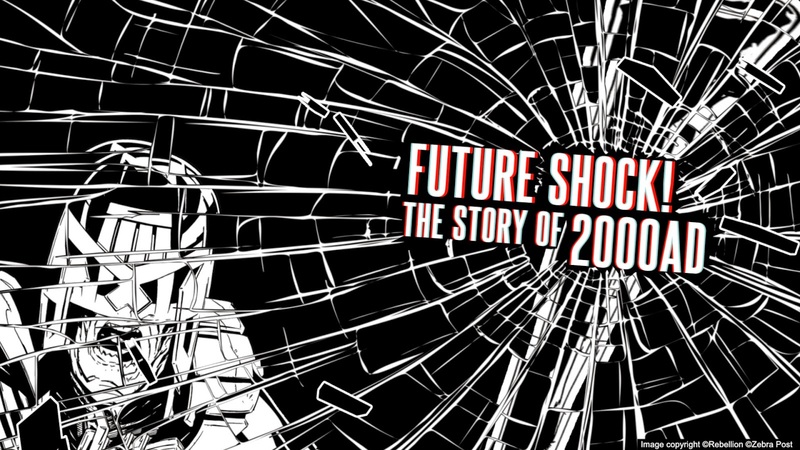 Future Shock! includes interviews with (almost) all the big names involved with 2000AD during its first thirty years, most of whom went on to bigger but not necessarily better things within the comics industry. As well as Mills, there’s Dredd’s hangdog co-creator John Wagner and the sardonic Alan Grant representing the old guard, along with artistic titans like Dave Gibbons, Kevin O’Neill, Carlos Ezquerra and Brian Bolland. Neil Gaiman, Grant Morrison and Peter Milligan are on hand to give their view as the second great wave of talent to pass through 2000AD’s corridors, and contributions from recent creators like Dan Abnett, Ian Edginton, D’Israeli and Emma Beeby (plus many more) bring the story right up to date. There’s even input from celebrity fans like musician Scott Ian and author/film-maker Alex Garland, who talk at length about 2000AD’s lasting and widespread influence across different genres and media. While a few of the interviewees’ claims are a tad contentious (there are some contributors who’d have us believe that the ‘dark age’ of mainstream comics, and thus the entire tone and aesthetic of modern superhero blockbusters, is wholly attributable to 2000AD’s transatlantic influence), we’re left with the unshakable impression that 2000AD is a small stone that made a very big splash, and the ripples of its influence are still being felt throughout the entire comics industry today. Although many people involved with the magazine have terrible stories to tell about their mistreatment at the hands of management (Alan Moore is conspicuous by his absence, having apparently refused to be involved with the film), these low points are outweighed by the overwhelming love which most interviewees show for a violent SF comic that became a British institution and worldwide cultural phenomenon. Various creators’ reminiscences about writing Judge Dredd or drawing Nemesis the Warlock are dominated by feelings of passion and a great sense of camaraderie, and it’s this positivity that ends up colouring the film most vibrantly. Hearing this endearing underdog story told by a such a charming cast of characters makes for utterly compelling viewing, and, along with the film’s stunning and innovative title sequence from Zebra Post, captures perfectly the illicit joy that young readers feel the first time they read an issue of 2000AD. There is currently no UK-wide release date for Future Shock!